I caught As Famous as the Moon at Hippos last night. AFATM is led by Dirk Zeylmans on tenor sax. It’s a smooth and very competent mainstream jazz band, playing latin, swing and some bebop. Dirk has a sweet sound. He reminded me of the Stan Getz style: in tonality (sometimes) and in phrasing (often). The other players were Chris Thwaite (drums), James Keith (double bass), Paul Dal Broi (piano) and Graham Monger (guitar). Chris is a great player who frequently appears around Canberra with different players. In this group, he traded fours in most tunes. James was solid and swinging at all times, taking a few nice solos. Dirk commented how he loves his long ringing sound and how it’s easy to play to. Graham was similarly competent, providing long and swinging solos. Dirk told me he knows every song under the sun. I thought Paul offered the most challenging solos for the night. They developed well and explored dissonance in the process. I can’t help but love montuno (those repeated one- or two-bar piano figures in salsa) and the lift it gives to latin tunes, so he won me over when they appeared. You can see Dirk and friends around town in many locations. They play Babar’s at Woden on Fridays at 6-8pm, and can even turn up to relax the bidders before some real estate auctions around town! 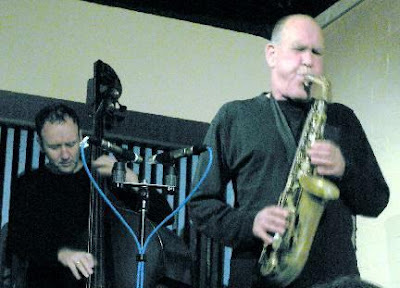 Bernie McGann played for The Gods Cafe's jazz series on 2 May. I missed it so no review (reviews for canberrajazz.net are welcome - just email to Eric). Thanks to Alison Hastie for the pic above. It shows Bernie McGann with Lloyd Swanton. Also playing were Warwick Alder, trumpet, and Alec Musso who replaced John Pochée on drums.